Musculoskeletal Disorders (MSDs) can be caused by a single event, such as a single lift of a heavy object. However, the repetitive (or regular) handling of smaller loads while in an awkward posture can also lead to an accumulation of injury, causing chronic pain. Whatever their cause, MSDs can impair ability to work at normal capacity. Not all MSDs are preventable but it makes sense to do what you can to stop workers being ill and off work; early reporting of symptoms, proper treatment and suitable rehabilitation are essential. An engine hoist for removing or replacing vehicle engines and a scissor table for lowering or replacing gearboxes. A powered conveyor will move tyres or other heavy items between levels quickly and safely and eliminates the need to carry tyres on stairs or ladders. 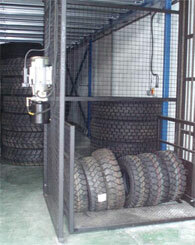 For heavy tyres or intensive use, vertical hoists are available. Handling aids can avoid the need to repeatedly carry items such as exhausts and tyres and reduce the handling-related injury risks. Sack barrows are useful, especially if stacking tyres ‘polo’ style. These protect the back and allow more tyres to be moved safely at once. Three-sided roll cages or trolleys are useful, especially when handling into racking. 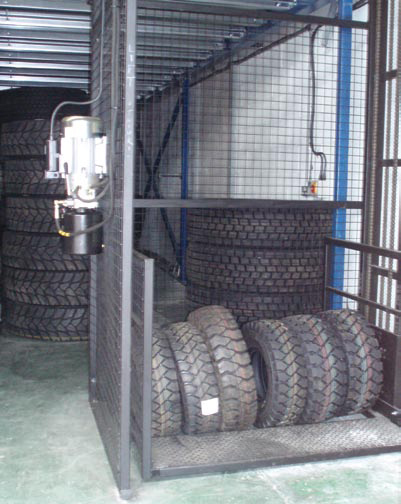 Delivery of tyres and other components in roll cages can mean the difference between repetitive unloading and carrying individual items, and a single trip pushing the roll cage. 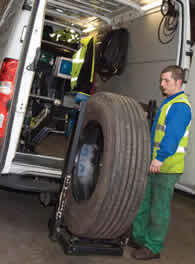 A tyre/wheel trolley or powered pedestrian-operated truck can help move large tyres. 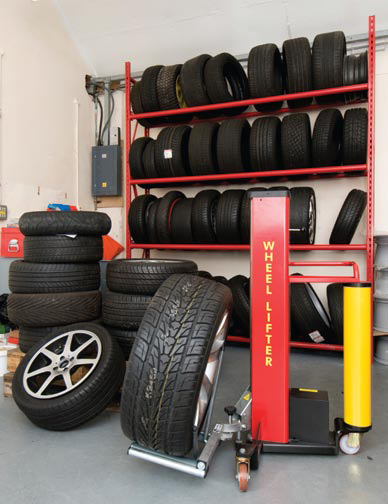 Tyre changers are available with integrated lifts to mechanically raise the wheel from ground level. Choose delivery vehicles and fitting vehicles with a low and level load floor. Make sure you can fit handling aids, such as ramps, that can stay in the vehicle and be used away from the depot. A ramp with a slope of 30 degrees or less is recommended. 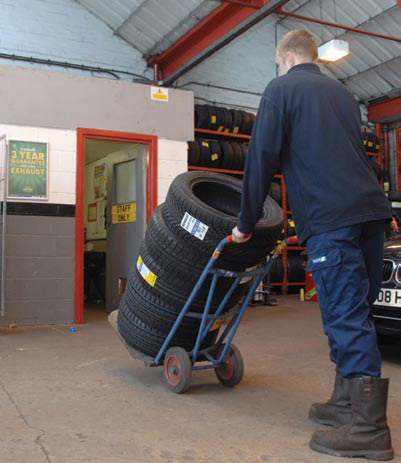 For particularly heavy items such as commercial, agricultural or earth-moving equipment tyres, use side or tail lifts. Avoid raising the heaviest tyres from the floor to the vertical – fit the tyre without removing the wheel from the vehicle where possible. 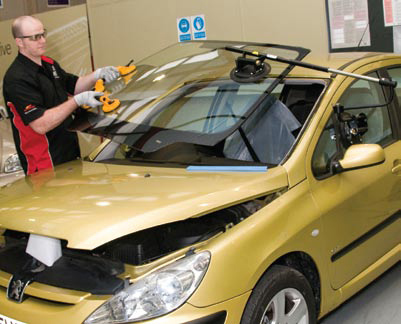 A lifting aid for replacing windscreens will allow accurate positioning with reduced effort. Further information see automative glazing page. A cylinder trolley for transporting gas cylinders and a drum trolley for moving oil drums not only reduces effort, but keeps the load secure. The manual handling assessment charts (MAC) are a tool designed to help assess the most common risk factors in lifting (and lowering), carrying and team handling operations. The MAC tool may be useful to identify high-risk manual handling operations and help in the completion of risk assessments. Online training in using the MAC tool can be found at MAC Assessment Tool. Set of seven downloadable Information Sheets written by the Tyre and Rubber Industries Safety Action Group (TRISAG) covering tyre handling across a variety of everyday activities in the fast fit industry.